Last month Joe and I paid a visit to author and seed saving evangelist Amy Goldman Fowler's amazing home, farm and were able to tour her garden. Amy lives about 7o miles north of New York City in Rhinebeck, NY, not far from the Hudson River. 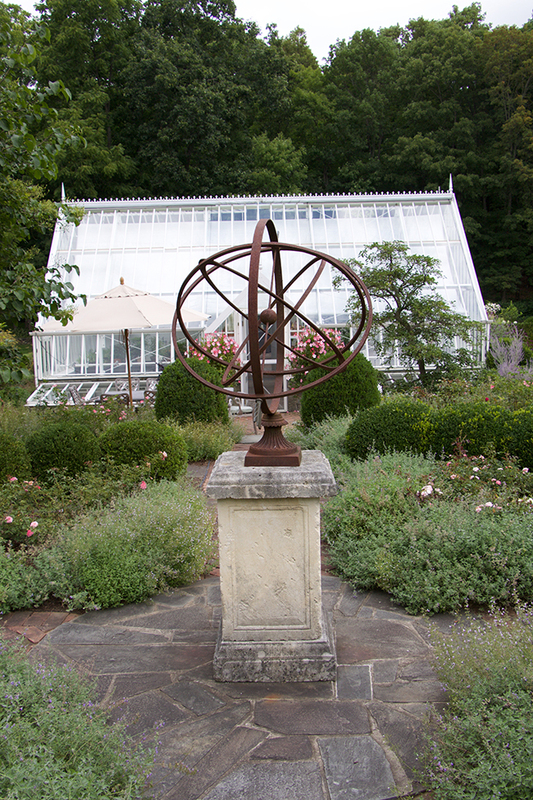 Her 18th century farm house, which she lovingly restored sits on many acres of woodland, pastures with stone walls, where she planted immaculate formal gardens, constructed an English-style greenhouse, and acres of farmland where where she raises not only heirloom breeds of beef cattle, but perhaps one of the worlds most comprehensive collections of selected food crops. Amy (and her husband Cary Fowler) are dedicated seed preservationists, and they treat their property as both a living laboratory, as well as a museum of studio. Projects are everywhere as are works-in-progress. In some gardens, only ornamentals are planted, Amy is an artist too, so things much look good, but one doesn't need to go far, to find little hints of little research projects. Some heirloom pea varieties in pots, set in the protection of the greenhouse only had reference numbers - something about protein values - but just another secret research project that one doesn't see everyday in our home gardens. Join me for a tour of Amy's wonderful secret gardens. The Goldman's farm house is a bit more than that, today, but it was built in the late 1700's, and remains humble and retains its original tone, set amongst large, ancient trees and a pond with a gravel drive. This is indeed a working laboratory, as well as a studio, and both Amy and Cary have their own projects at hand. Amy has been privileged to employ a handful of talented professionals over the past 20 years to create a world of beauty outside of the orchard and vegetable garden gate. Mary Riley Smith, working with landscape architect Donna Gutkin, created a semicircular 'new traditional' perennial garden filled with old fashioned perennials. A closer look at Amy's garden can reveal some interesting curiosities. A tangle of 'Love-in-a-puff', Cardiospermum halicacabum - a sub-tropical deciduous vine not often seen in gardens today, adds a note of horticultural history as well as a bit of romance to a lovely verdigris kissed focal point. No question that a knowledgeable plantsperson lives here. 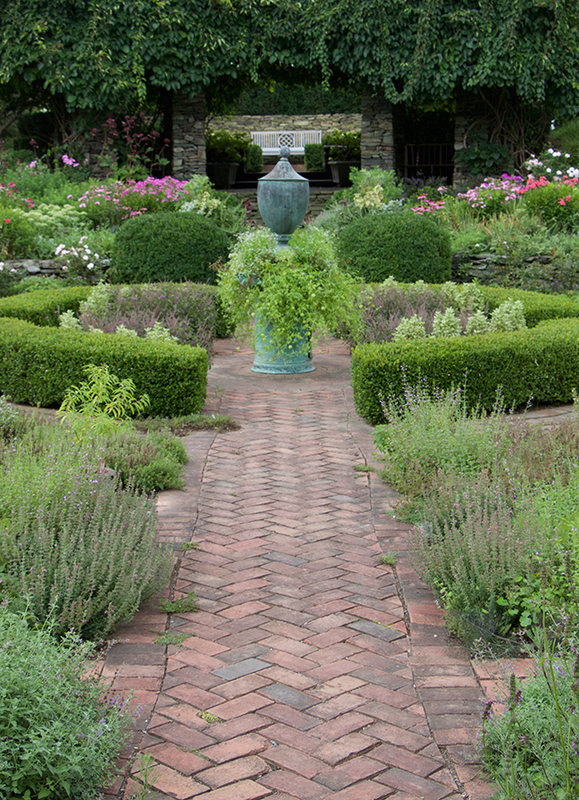 Years later, Lisa Cady, no head gardener, designed an herb garden that gave Mary's garden its other half. For the past ten years, Lisa has done a wonderful job as steward of the perennial garden and keeper of the flame. 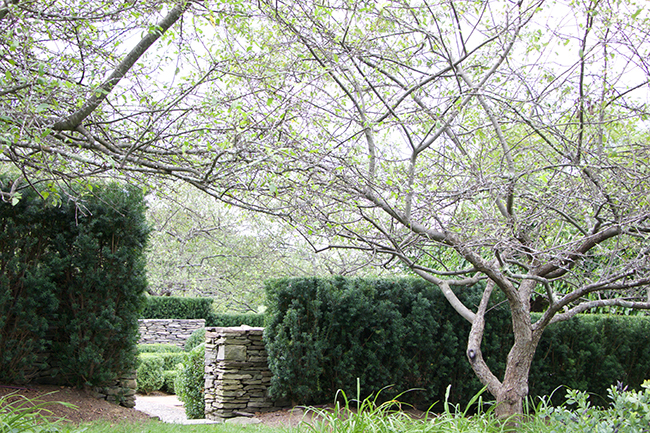 Landscape designers Tom Pritchard and Jody Rhone expanded the built environment in many new directions. Amy's book, Heirloom Harvest, tells the entire story, which ranged from the properties history, through this on-going evolution. Garden design, as we know, never truly in complete. 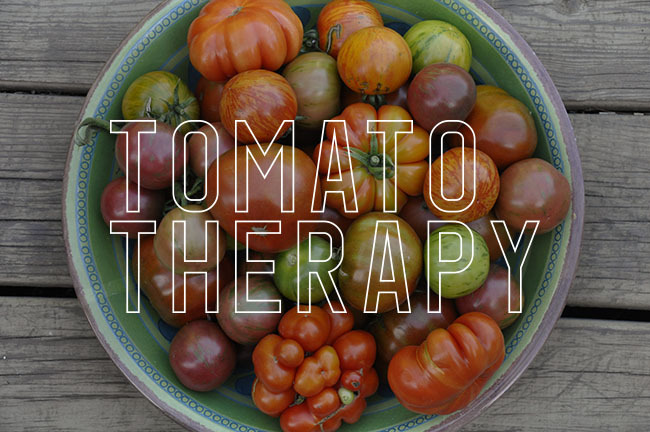 In Amy's orchards and vegetable fields, where Amy really gets down to her preservation and collecting herself, antique and heirloom varieties exist in separate collections. 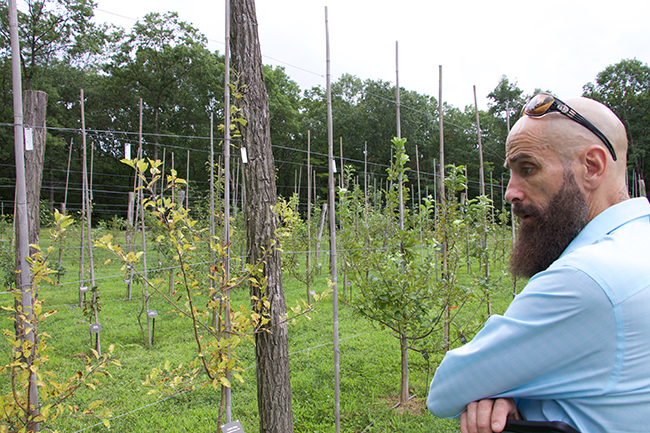 In one orchard which was recently planted, apple varieties were being trained with all the care and accuracy of those in any living collection at a world-class botanic garden. Right down to the labels. To focus on Amy's many books for a moment - - if you don't have them in your library, trust me, you are missing out. They are magnificent and useful as well. A rare thing with most gardening books today - especially if you are a plants person. Her books include Melons for the Passionate Grower (Artisan, 2002), The Compleat Squash: A Passionate Grower's Guide to Pumpkins, Squashes and Gourds (Artisan, 2004), The Heirloom Tomato: From Garden to Table - Recipes, Portraits and History of the World's Most Beautiful Fruit (Bloomsbury, 2008), Heirloom Harvest: Modern Daguerreotypes of Historic Garden Treasures (Bloomsbury, 2015). Any one is no more greater than the other. Joe looks a little 'nineteenth century' too, while learning about antique apples. Amy's books are created with thoughtful balance and one gets the sense that each detail was carefully considered, from the paper stock to the visual layout and design, and then of course, right down to the content - which is so well researched, written and photographed( and by photographed, I mean by well known talented professional artistic photographers like Victor Schrager, whom many of you may know from his earlier work which included many articles for Martha Stewart Living Magazine). To add onto the visual impact of photography as a collaborative addition to these books, Amy's latest book 'Heirloom Harvest', involved an interesting collaboration with Jerry Spagnoli - it features vintage-style daguerreotypes which alone are striking and each, a work of art. I am certain that whenever a plant person closes their eyes and dreams of a greenhouse, this is what they dream about. 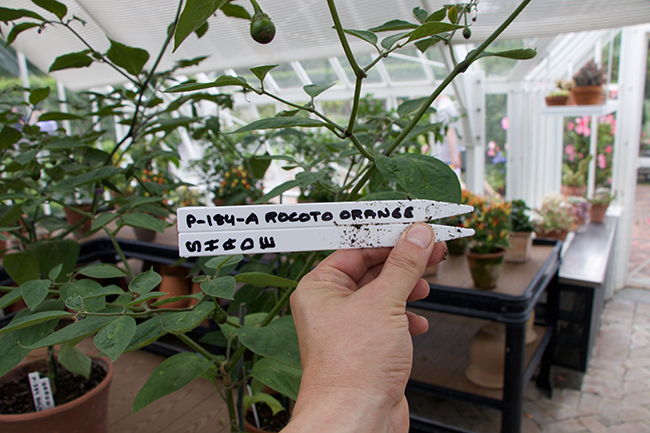 Amy Goldman's Greenhouse in late summer was filled with interesting and beautiful pepper varieties. So imagine this entire process for a moment - sourcing rare, heirloom of lost seed of varieties and antique vegetables and fruit, then raised them in the most perfect conditions that you can, and then bringing in a large format camera into a barn to shoot the fruit in perfect lighting, in season, on the farm. Amy become more like a producer and conductor of a fabulous orchestra of talent, not excluding her own, as she really steps out of her Manolo's and into raincoats and lab coats- not afraid to get dirty in the garden as well. She's a hand-on type of woman. In control, and deeply engaged with her projects. I've visited a few very lovely gardens this summer, and noticed a trend of contemporary design mixed with classic design. I suppose straight lines, geometry and symmetry could always mix well, not unlike architecture, but this is a garden which clearly has a thoughtful curator behind it, and one who isn't caught up in merely recreating a period garden. 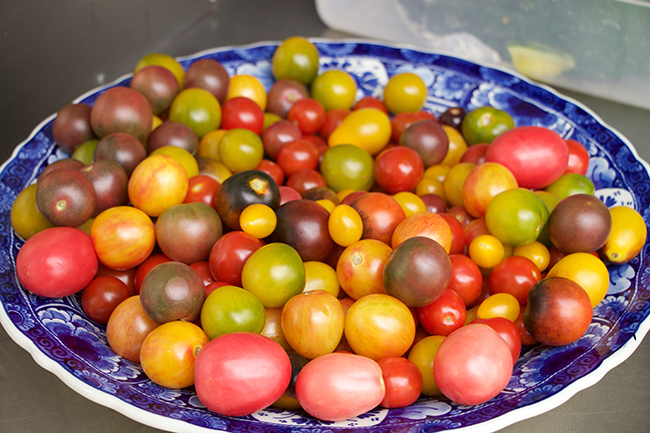 The classic plate of heirloom tomatoes, but in Amy Goldman's garden, they are even more interesting. We all can learn from viewing other gardens, and I always take mental notes (and sometimes use this blog as my visual notebook) when visiting gardens. 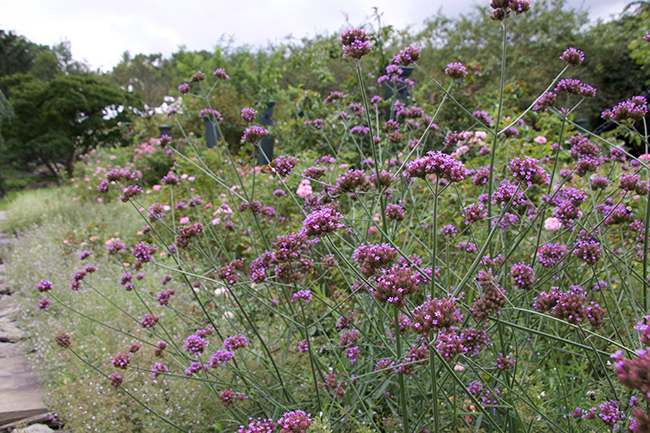 Verbena bonariensis can be rather 'meh' when planted as a single pot plant but in multiples, floating above goundcovers? It's effervescent. If you are lucky, it will self seed - skip the mulch, let magic happen. I could go a step further, since design is so important to me given my day job - if one is going to craft an important book, there is another essential part of the process which usually is cut from the budget when contracting book agreements with the publisher - and that is the design of the book. So the fact that Amy has added another partner into the mix, to ensure that these books are more than just novel product, but a real contribution to a library irregardless of ones interests, then having Doyle Partners a New york design firm guide the overall process and apply their visual excellence with layout and design is a brilliant move. If there is one take away here, it is that of respect. Respect for the topic, respect for talent, and an overall respect for everyone involved with the process of making a book - but, it all begins in Amy's mind, and then, in her gardens. A pink variety of tomato that really is pink. I really want to grow 'Thai Pink'. I particularly appreciate the lists of varieties, those which have synonyms, and the historical information about each type which she lists under each variety in all her heirloom book series. This is so helpful, and interesting since much of what exists out there in other books, is just shared information. Amy has taken the time to triple check and fact check as much about each variety as possible. Summer blooming -pink alamandas in containers frame a side entrance into Amy's English-style greenhouse. Fragrance has a key role, in this view also. A formal rose garden with paths edged in catmint lining native stone appeals to all of the senses. Ultimately, the truly successful achievement here is one which is often tougher to create, a massive and impressive place which somehow still feels humble. This can only be realistically achievable by one who is intensely active in their own garden (and sure - by those who has the means, but lest we forget the 'means' is what makes this happen.). Really though, I feel a different type of 'magic' happening here, because for some reason, it all just feels like 'home' - - which is what I think Amy was ultimately going for. It's not as conscious as it may appear to be, at least to me. Rather, I take away that this is 'just what she does', and it happens to look good because good taste is involved. 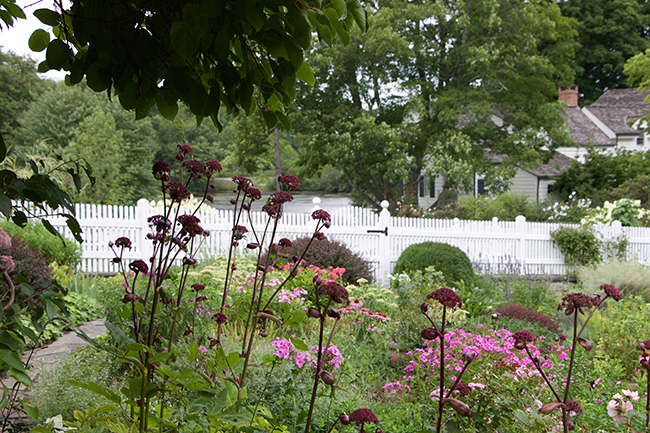 There are a few gardens like this that I have visited, Kris Fenderson's in Vermont comes to mind, as does the magical place of our dear friends which near us in Rhode Island - the beautifully unique Sakonnet Garden owned by John Gwynne and Mikel Folkarelli. Then, there are the places which dream of visiting such as the Gardens at North Hill by the late Wayne Winterrowd and Joe Eck (if they are still there? ), and although Dad Hinkley's Heronswood is back on the map, and I've visited there a couple of times, I have yet to take up his generous invitation to stop by Windcliff, Dan Hinkley's and Robert Jones' magic idyle, not to mention Martha Stewart's Bedford Farm or even her Skylands Maine getaway -- all are top tier private plant destinations which are deservedly, so special. 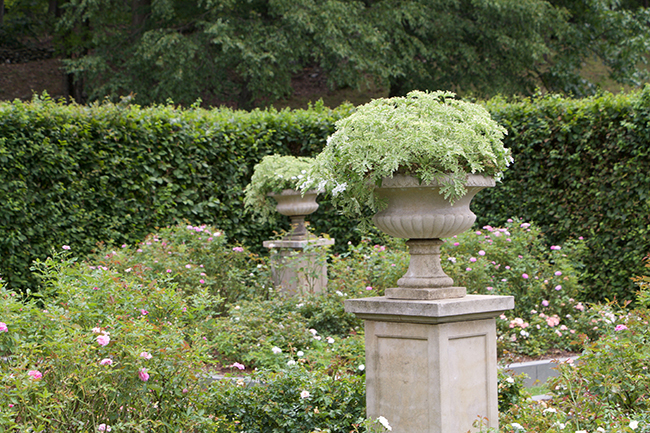 Rose scented geraniums set alone into urns strategically placed in a formal rose garden. Simple. yet so effective. 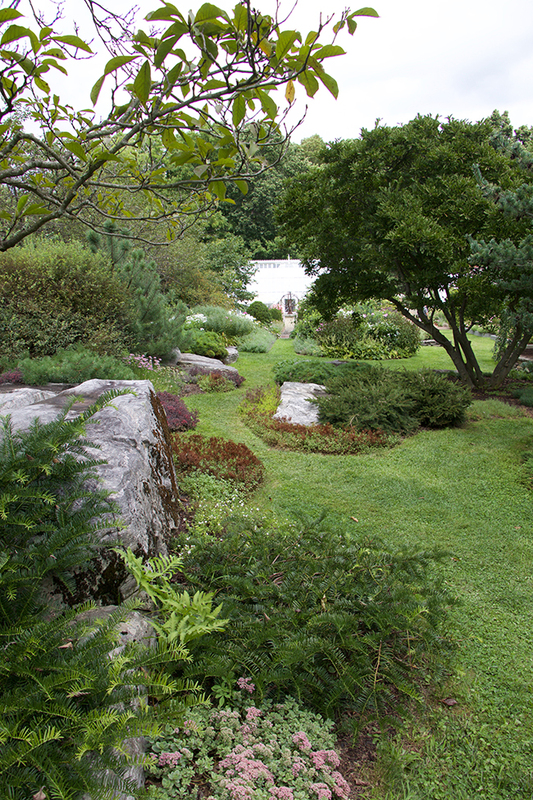 The rock garden was a pleasant surprise, and offered a transitional space between the more structured part of the garden, to the woodland and orchard beyond. One could say that this is a very personal garden. Anyone who knows Amy knows that clearly she has some help here, but not in the way you may imagine. Amy really wanted me to make it clear that she does have (in her words) a 'gem of a garden designer - Lisa Cade - who designed the herb garden and some of the perennial beds' and together, their small staff of three handle much of this fussy work, but then, there is the farm - the fields of melons, tomatoes, acres of squash and peppers, the vegetable and kitchen garden, the orchards and other small fruit - which is all Amy. Clearly, she loves doing it all, which I can also relate to. Which helps explain why this place feels so personal to me. In many ways, it's a very Jeffersonian' approach to farming and gardening. Everywhere one can see the results of the 'person's - be it plant selection, curation and surely, editing. Thoughtful gardening is noticeable. And all of our gardens should work this way. Believe me, I know. Folks are always asking me "How do you have the time to do all that you do? And my answer is often the same as Amy's or Martha's or that of anyone of you who truly are obsessed with plants and gardening - we make the time because we care. Heirloom watermelons grow in a field dedicated to just melon varieties, each with a story and history dating back hundreds of years. 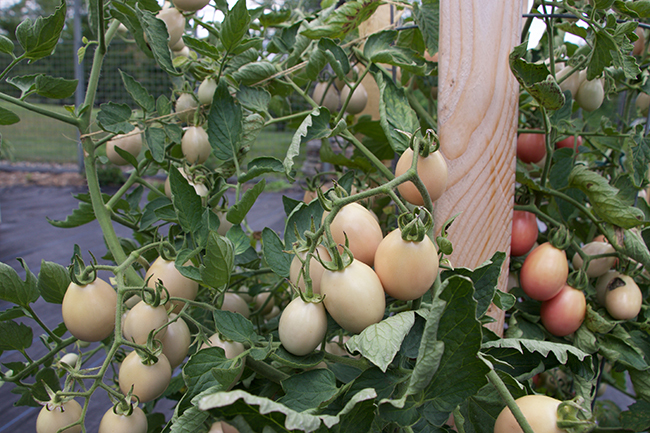 But not just heirloom varieties grow here, newer selections are too. No melon left behind. Moving away from the more designed gardens for a moment, and one can see how quickly things go rural and wild, which was fun. Farm roads here lead to even more serious fields and crops. Tractor paths lead one up a hill where an acre or two is planted with just hundreds of varieties of peppers (yeah - I sense another book coming.). It was breathtaking, and a bit overwhelming. Gorgeous? You bet. Amy harvests a nice yellow fleshed watermelon. I enjoyed how Amy didn't care that she had white pants on when she asked us if we wanted to take a tour of the more interested parts of the garden - her trial fields, where she grows much of her collections of heirloom vegetables. I mean, she didn't even hesitate to jump in her truck (Oh, OK, her white Range Rover) and drove us across the property to a hill to, which she expained to us was actually a geological phenomenon known as a drumlin - a spot where especially rich soil was dumped by a glacier during a past ice age. Just as a thunderstornm begane to roll in, which would cut our visit short,Amy jumped out of her truck and in her Fifth-avenue-y sandles and all, she whipped out some secateurs and snipped off some ripe water melons for us to take up. Amy is part farm girl too, I am guessing. 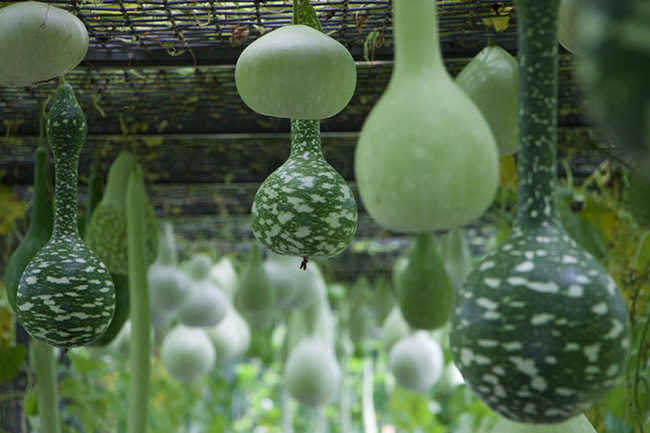 Gourds, from bird-house gourds to bottle gourds, luffa and more - in Amy's gourd tunnel. On our way to the melon collections, we stopped to see a surprise - this amazing 'gourd tunnel', constructed from coated steel, and perhaps 70 feet long, amazed us with dangling gourds which were larger than by very-gourd-sized head.This alone was worth the trip, as we strolled down among the bottle gourds, luffa's and bird-house gourds, we felt like children seeing something special for the first time. Before the storm hit, Amy led us to a few other of her carefully tended fields, first one just planted with tomatoes, and then another just dedicated to squashes, both summer and winter types, and then another field completely planted with peppers - I mean, maybe a few hundred pepper varieties. A chili pepper fanatic's dream. 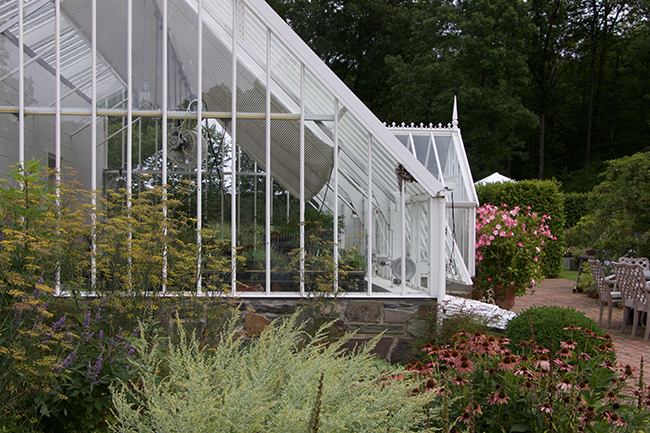 Fennel blossoms and asrtemesia break the formality and structure of this gorgeous greenhouse. You can tell that this is a plant lovers garden. 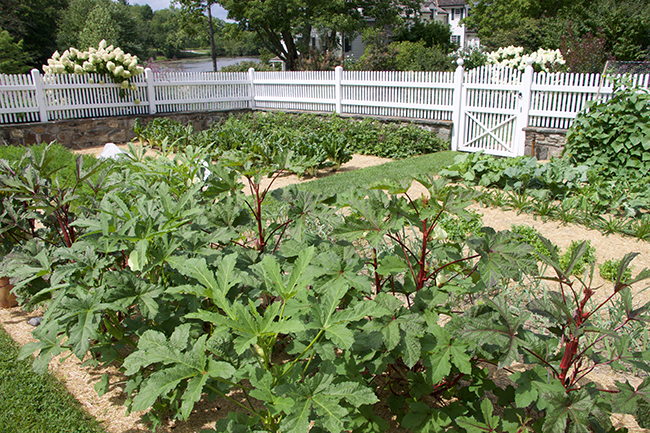 The kitchen garden was neat and tidy, with rows of beans, leeks and other vegetables which are grown closer to the home. The fence keeps out critters, or at least, woodchucks and deer. 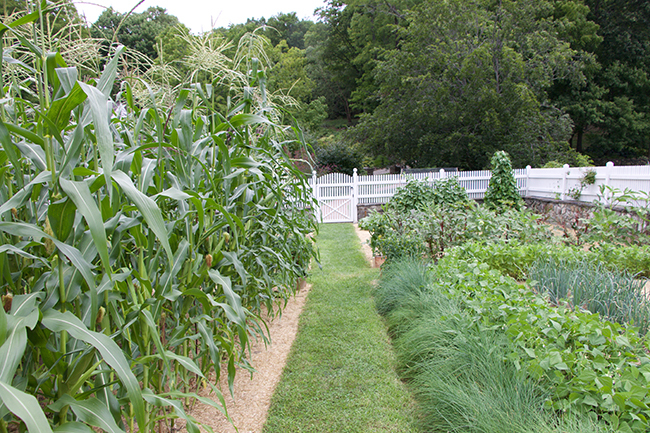 Given all of that, their home vegetable garden certainly would not be just any vegetable garden. I mean, given her connections in the vegetable underground and knowing about some of the planet's rarest and most interesting food crops, I kind of had to know what would be worthy enough to make the short-list and earn a place in the kitchen garden? The answer was Malabar spinach, red okra, red cow peas, puntarelle, swiss chard, kale, and cilantro, to name a few. I have to admit, it was a bit like peeking into a movie star's refrigerator for me! The quintessential kitchen garden, the sort most of us could only dream about. And as for crops? Have you ever wondered what serious seed collectors grow in their gardens? As you can probably see here, Amy's husband also is no slouch - Cary Fowler is the former executive director of the Global Crop Diversity Trust, (he was influential in the creation of the Svalbard Global Seed Vault in Svalbard Norway) and he was appointed Member of the Board for International Food and Agricultural Development by President Barack Obama. This all made the idea of peeking into her secret vegetable garden even more exciting. It kind-of changed what I want to grow next year. I never had the chance to ask more questions about the particular varieties being trailed in the vegetable garden, or even if they were just being grown as kitchen product (Amy is reportedly a fine cook, as well), but I'm pretty certain that nothing goes to wast here. My good friend Abbie Zabar shared a photo with me of a basket of veggies, that Amy and Cary delivered there a few weeks ago! Good cooks share their puntarelle! 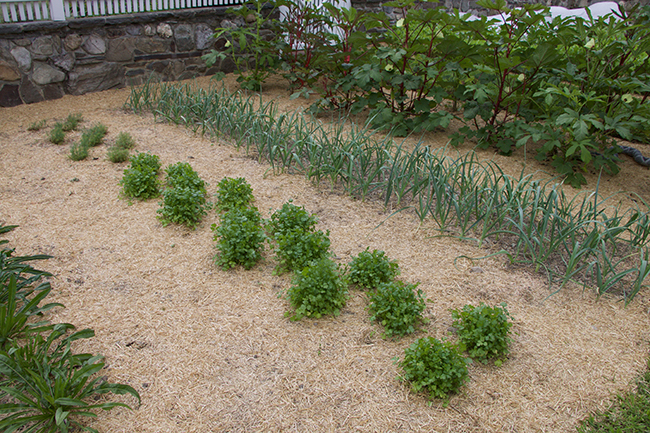 Puntarelle, in the foreground grows in a bed mulched with straw along with cilantro, leeks and red okra. In this beautiful walled vegetable garden above grew 'Pinkeye Purple' Cowpeas, rows of Italian puntarelle - which is a dandelion relative popular in parts of Italy, and something which I tried to grow this year, but failed. ( hmmmm - does she have a Puntarelle slicer I wonder? ), and then there was a plot of multi-colored corn - which I heard was a formally lost variety, or an endangered variety, but I never got the details on it. All I know is each plant had a different colored ear of corn on it which made the plot quite attractive. 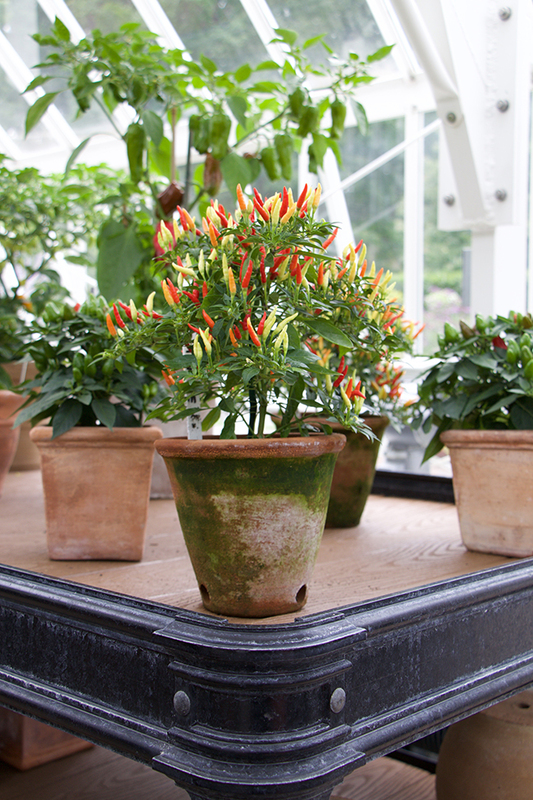 I was most inspired by the potted peppers - attractive plants of chilis and hot peppers, some of which had to be kept in a greenhouse because they needed extra warmth perhaps. 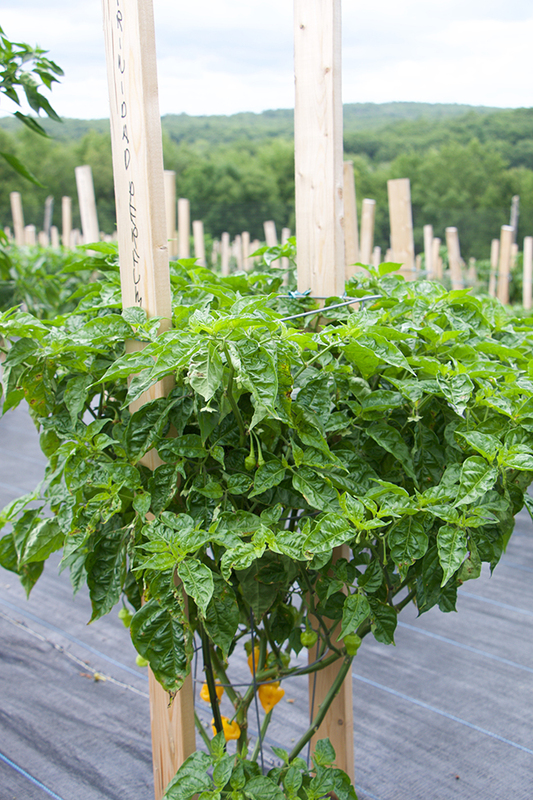 In the fields, peppers were dedicated to one hill, with hundreds of varieties set on on a drumlin, where there was exceptionally rich and deep soil left by a glacier. I think I could have spent hours writing down my favorite varieties that I wanted to try. 'Pumpkin', a more ornamental pepper, earned a space in the greenhouse where other prettier, and smaller peppers were being trailed in pots. I've raised some peppers in containers this summer too, and they performed better than those in the garden, but smaller varieties deserve even more, to be raised in pots. I mean - look at these? They are the Pokemon of peppers - gotta catch them all! 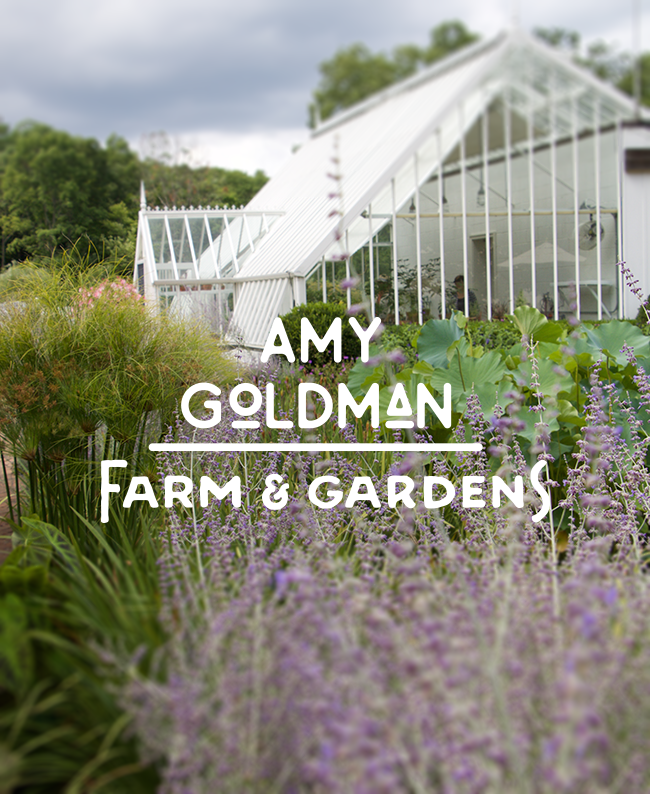 As a plantsman myself who keeps a greenhouse, I was very interested in what was growing in Amy's beautiful glass house. I knew that she used it to start the thousands of vegetable seedlings in the spring, and I has assumed that beyond that use, that the space was either empty for much of the year, given that a permanent collection of conservatory plants might reduce the amount of space available for more practical crops. I was happy to discover that there was a little bit of both. I mean, how could a real plant lover resist keeping some tubs of conservatory plants under the benches, that could be brought outdoors for the summer. I also noticed a collection of what appeared to be Australian plants (Banksia, grevelliea and some potted trees, succulents and even bonsai. Yay - Amy passed the test of being a legitimate plant geek! 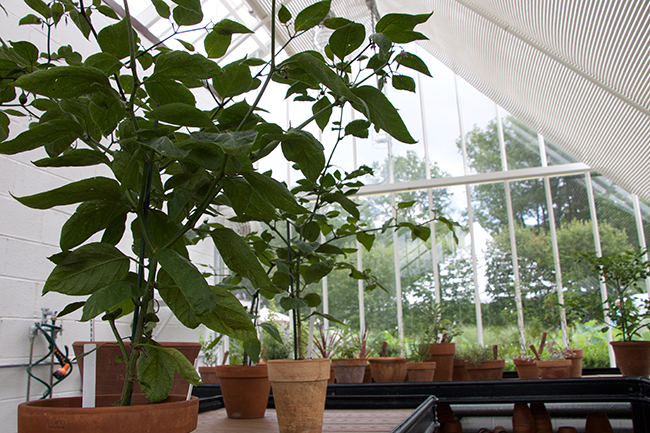 Mostly though, I was attracted to the summer use of the greenhouse for potted peppers. 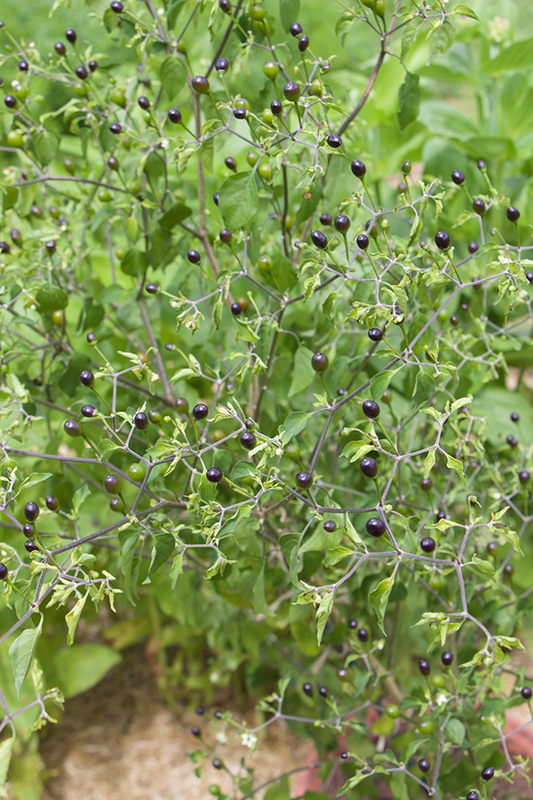 We all know about ornamental solanums and peppers today - Black Pearl to Holiday forms as disposable plants, and even here, Amy kept some very ornamental types which I assume were pretty enough and small enough to earn space on the benches - why waste them up in a farm field with the others when one can enjoy them up close? 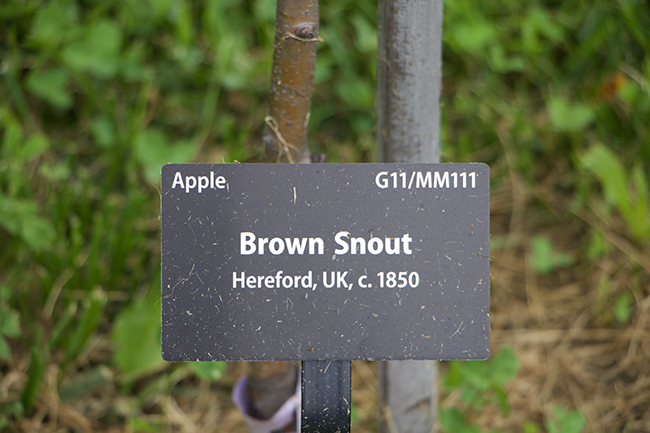 But then, there were the more' horticulturally interesting' types, and maybe even important agricultural varieties, which only had numbers on the labels. Suddenly, things began to look for sciencey here. Of course, there were plenty of culinary types as well, but I am guessing that they were being grown here more for their ethnobotanical contributions than as ornamentals - that said, these were the ones which attracted me the most. The many peppers both out in the fields being trialed or raised for photo's were interesting, but I found that ones in Amy's greenhouse to be even more curious. Rococo peppers grow like a tree, lasting many years in a pot, it seems that they need some greenhouse protection, even in the summer. Check - on my list for 2017. So in the greenhouse an outdoors, things began to feel more like a botanic garden collection than just 'a garden', which is precisely the way I like to grow and collect plants. I learned - by reading labels and later by Googling the varieties. Thank god for the internet. I need to ask Amy more questions about these. Were they an experiment? I could find some posts by chili-pepper enthusiasts (those with crazy beards and who have written long posts about obscure chili varieties that could 'make your tongue feel as if you licked lava', but not much more. I love finding things to research more! Many of these were selections of 'Rococo' peppers - they were well branched, with buds ready to open, and had fuzzy leaves, and it was only later at home, when I learned some basic facts about these plants - types of peppers which can be grown on for a few years, also known as tree peppers, with fruit which is exceptionally hot, but I found these pots as a botanical collection more interesting. Fruited vegetables which have deep, cultural roots with primitive cultures are most interesting to me, more so than our modern vegetables (carrots, celery, cabbage) which have evolved through selection into nothing like their primitive or wild selves. Some peppers out in the garden, set around in pots were fascinating, if only because of their historical and culinary purpose. This one called 'Chiltern' is reportedly very hot, but I don't care - it's pretty too. 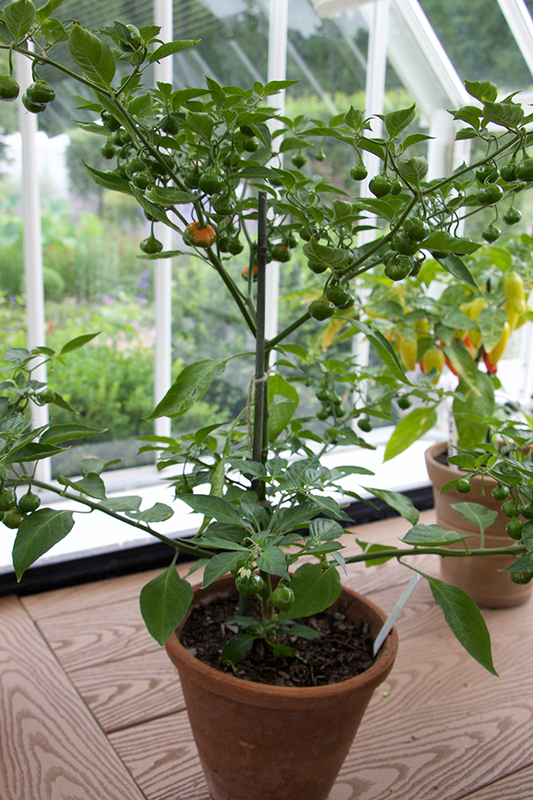 Bolivian peppers look as if they grow larger too. I wonder how big these will grow in these pots, and how long they can remain in a pot? 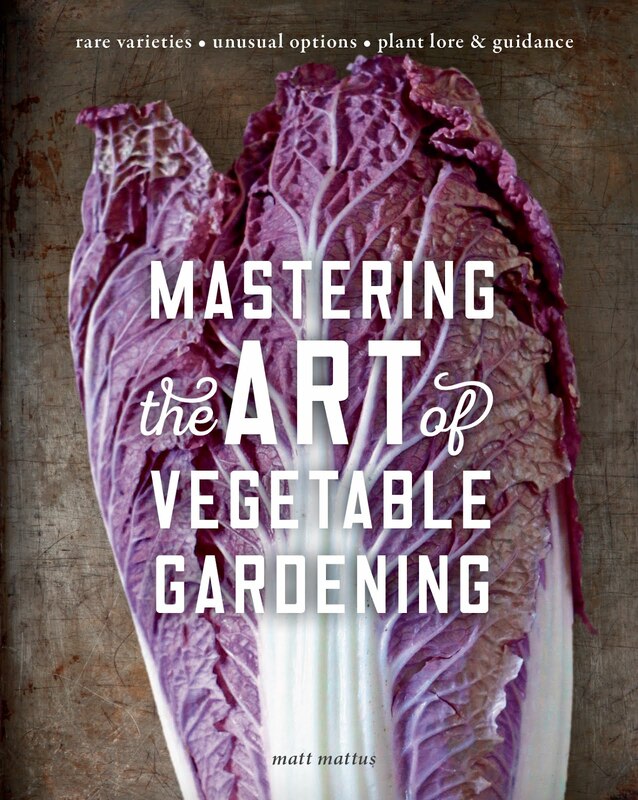 So much yet to learn, but for a gardener, that's exactly what keeps me going. 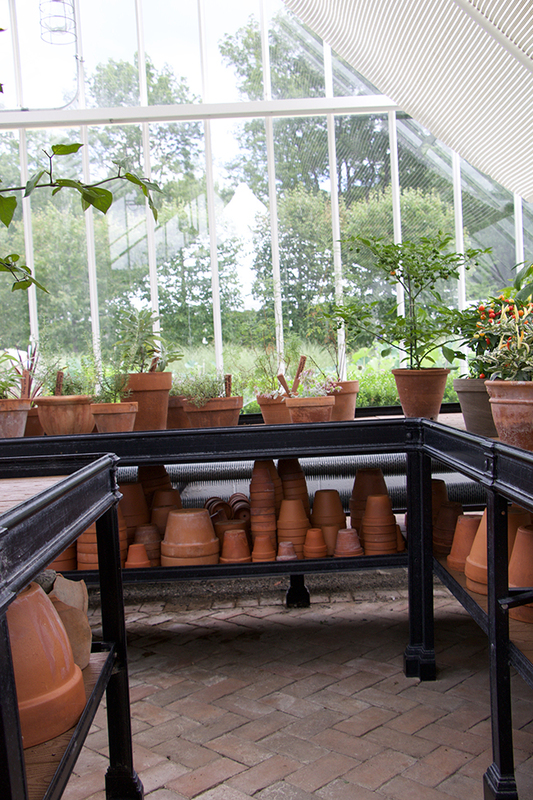 If only my greenhouse looked this tidy - and those benches! English cast iron benches may be the norm in the UK, but rarely seen in this country. I've had these on my Pinterest board for a few years, but I have settled for pressure treated wood benches from Home Depot! Amy told me that she is focusing on photographing more squashes this autumn, watermelons too - as she works on updating new editions for her books (yay! ), and if a pepper or chili book is coming down the pike soon - we all would be so fortunate! Let's all keep our eyes open for new Amy Goldman books - until then? 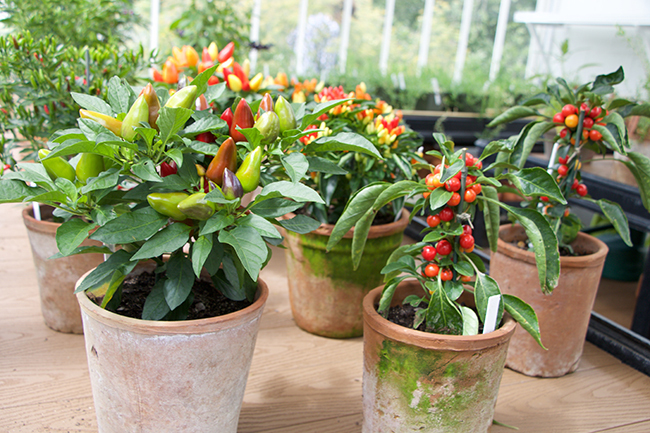 Consider growing chili peppers in pots next year! It's on my list for certain! 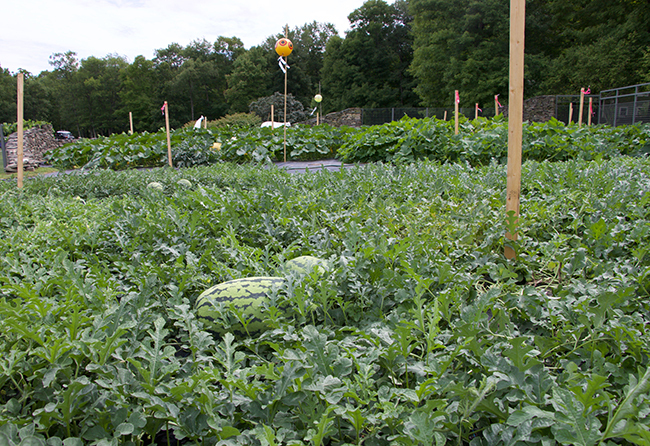 Wow Matt, what a fascinating garden/farm to visit and share with us. Amy & Cary are inspirational. Thank you, thank you, thank you Matt!!! What a wonderful, extraordinary garden, thank you for sharing. You are welcome, Heidi! It is an extraordinary garden! I think you should have given Ms. Goldman's Head Gardener, Lisa Cady, some credit in this article. I deal with Lisa on a professional level and she is very dedicated to making these gardens beautiful, biodiverse and functional. That small maintenance staff you mention is mostly Ms. Cady. I agree - I never knew who her gardener was! Now I know! Naturally, all of us who garden can imagine the work she must put into all of this - yes! Lisa Cady deserves as much credit for this amazing work - what a project. Clearly, she must be an awesome talent, and so fortunate to be a part of this garden and project, really! Thank you for adding Lisa into the article. I've personally learned a lot about horticulture and garden design from her and she really is an "awesome talent". I look forward to your next blog post.